In China, white people get an inexplicably large amount of respect simply by being white (I didn’t use “foreigners” here because people with darker skin are typically excluded from these “perks” regardless of their country of origin). You get preferential treatment when it comes time to find a job (often making several times what your Chinese counterpart makes)and even in Chengdu, a city with a decent number of foreigners, Casey and I were offered positions as “marketing managers” for a wine company while we shopped at a supermarket. A few months ago, I was offered a spot in an advertisement for a nearby restaurant. For reading a few lines in Chinese I would have received 2,000RMB (close to what a factory worker earns in a month), and a scrumptious banquet for my friends. The premise of the commercial was this: three Chinese men would spot me sitting in the restaurant’s lobby and say something about me being a foreigner, to which I would respond by explaining many of the simple pleasures that could be found in Chinese alcohol, art, and food. At the end we would part-ways and I would say something like, “I understand China.” Unfortunately the deal fell through due to scheduling problems. Unfortunately, few Chinese commercials promote foreigners in such a positive light. Hopefully a more confident China will eventually lose the trope altogether, but I’m not holding my breath. By T in Uncategorized on October 31, 2011 . So glad you did a post on this. I’ll leave it at that. I’ve been waiting for you to write about this. When I first began my China experience I thought it was pretty rad that white folks got so much attention but now, after having to deal with several uncomfortable situations and bizarre expectations, I’m not so excited about it. Best case scenario, the fascination with white foreigners will peter out in a few decades when more Chinese people have had dealings with us. I really dislike this kind of treatment, as I do the ‘we don’t want foreigners with Asian faces’ employers here in Korea. My Scottish friend in Beijing (balding forty something male) caused huge amusement to his Chinese friends when he advertised a hair restorative product. He posed for the commercial as himself for the “before” part and wore a wig for the “after” part – miraculous results indeed! My European friend was offered 100 rmb to wear a suit to a 45 minute business meeting for a company he didn’t work for. He was not to say anything in the meeting, just nod a few times. He was obviously being asked to assist a local company to build the perception that it was legitimate with western style management and corporate governance. One of the perks of this Laowai syndrome is that when my wife and i travel to the third tier cities, i often get approached to have my picture taken, almost always with a group of 20 something year old girls. Hey, not too bad a gig! But they always hand my Chinese wife the cameras and want her to snap the half a dozen pictures! Drives her crazy. She wants to charge shou fei (fees). I thought it was interesting for the first few months, until I visited a tourist site, and everyone wanted to get their picture taken with the camel, and then get their picture taken with the foreigner. It is strange to anyone who’s grown up in a culture that is at least somewhat mixed to be in a place where a redhead or a person with dark skin can actually be so distracting to passersby that they crash their bicycles due to inattention to the road. Or when young children see you and burst into tears and run for their mom. “It is strange…” Because no matter what one KNOWS logically, it is still not the reaction one is used to. 30 years of people acting “normally” is not wholly replaced by 10 years of living in a different culture where people have a different idea of what is normal behavior. I would never stare so hard at a foreigner that I ran my vehicle into a tree, or another cyclist. Because: (1) it is nearly impossible to tell who the foreigners are in my hometown, and (2) it is a matter of priorities – I am operating a vehicle, unless something catastrophic happens, I must operate my vehicle in a safe manner, as I am responsible for my safety and the safety of the others around me on the road. That is how I lived for 30 years, and then I switched cultures. Even having studied the culture and the language, and lived there for a decade, it was still suprising to me at year 10 seeing bicyclists crash simply because a woman with black skin biked past them going the opposite direction. Not as suprising as year 1, but still suprising. Did you see the news story about the expat mom that, while shopping, was shocked to find her daughter’s picture on a Chinese manufactured toy? The daughter’s photo was apparently taken off a Facebook like social media site and used by a Chinese PR or graphic design firm that assisted in the layout of the toy box. How weird would that be if you are shopping in the store and there’s 50 little images of your kid sitting on the shelf next to the Slinky toys? I beg to disagree. White MEN get respect. White women are viewed as whores, and treated accordingly. It’s why I can’t wait to get the hell out of China. I’ve been living in China for long and I would like to say that yes most people considered me not as respectable as chinese girls(I am “girl”)…I don’t smoke, I don’t swear, I don’t drink, I don’t wear clothes that can offend the chinese culture.I don’t really think that emancipacion, as you say, is closely related with drinking, swearing, smoking etc…so I don’t understand why you say that I wouldn’t be welcomed in China. I have been studying chinese culture and language for more that 15 years..I have many good (chinese) friends here in China.I am not here to LOOK FOR a husband and I don’t consider depressive the possibility that chinese or “foreigners” don’t like me, and wouldn’t take me as a “wife”. That’s not a woman first prerogative in her life, I personally think. In any case, please let me disagree with your vision of chinese woman, I have been teaching in a high school and I can say that girls in (some parts of) china are just like girls in the rest of the world..they smoke and drink…way much more than my male-white-colleagues. My ex-company boss was a chinese strong woman that smokes and drinks, and I can assure that she was considered as respectable as other chinese women or probably more because she is quite rich and powerful. White man are interested in what they like…that can be girls of any kind, and from my experience, I would say yours “white men are interested in chinese and not in you” is quite a big generalization(as you said). I consider that you’ve been too severe with the view of chinese and not-chinese femenine background, but it’s just an opinion. ha, this reminds me of a karaoke party at work — it was a Chinese company that published the local expat magazines in Tianjin, so there was me and two other white guys in the room. One of the other white guys was a woman, and she smoked. Some of the Chinese and Korean guys just couldn’t get over it, especially the Koreans. They even told her directly that her smoking was like a man… they seemed intend to impress this idea upon her, like they thought she maybe didn’t realize what she was doing. It was funny. To see both of their reactions: the Koreans for being so incredulous and earnest, and the (newly-arrived) American woman for not having a clue how her actions were perceived. As someone whose face is on the sides of buses, billboards, and outdoor video screens in Tianjin (and whose back of the head is in the 1911 movie! ), I can testify that being a white guy definitely has its advantages when it comes to advertising. But I suspect that our general notions of “respect” and what Chinese people mean when they use that word are significantly different. I’m sorry to be so fussy, but you really should look at your apostrophe usage in this sentence. Thanks, I’ve fixed the sentence. 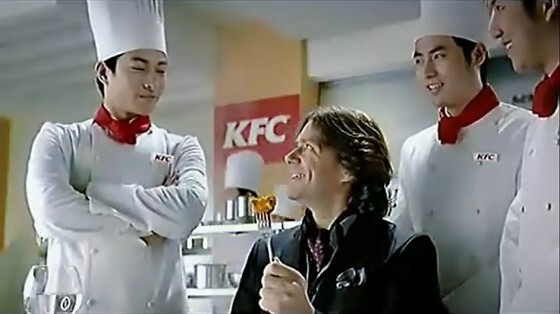 I notice that KFC does not use the phrase “finger lickin good” in China! Sure, there are Asian guys who only want an “experience” with a white woman, and there are (more than a few) white guys who have fetishes for Asian women. But I know plenty of interracial couples in Korea (yes, even KOREAN men married to white women). Are they totally accepted by society as a whole? Not yet. But their families seemed to have welcomed all of them. And before you start claiming these marriages were for a Green card, half of these couples have chosen to stay in Korea and settle down. As for never gaining real respect, I’d have to disagree with you there, also. True, there are a bunch of outgoing white females who behave in ways which aren’t in line with what is expected for Asian women, and yes, they give us a bad rep. There are also a bunch of outgoing white men who behave poorly and leave behind a bad impression. I don’t want to go hang out in the areas near the military bases or foreign areas because that’s usually what you can expect to come across. However, I can tell you that because my husband and I don’t behave like college kids on permanent spring break, and are hard workers, respectful of seniority and make an attempt to respect local traditions, the majority of my colleagues have confided in me that they used to have a bad impression of foreigners because of the stereotypes, but now that they have met us, they see that we are not all that way. I think much of it really has to do with both sides not understanding the cultural rationale for the behavior. I had a colleague tell me a common stereotype of Americans is that parents don’t love their children because they allow their kids to leave home at 18, and the children don’t love their parents because they don’t pay them back for their support when they are older! Explaining the importance of independence in (individualist) American culture is hard for someone from a (collectivist) Confucian culture to wrap their head around at first! That’s why this blog is a great way to look into Chinese culture in an attempt to understand it better. You do bring up some valid points, but it sounds like from all of your comments that you have struck out with women on both sides of the world, and I am going to guess it’s for your chauvinistic attitude and knack for offensively stereotyping people! Well, I’ve seen KFC China used the phrase 吮指回味 in their commercials a few years back, which is a rough translation of “finger lickin good”. Tom, I think you dodged a bullet with the commercial falling through, the basic outline sounds horrendous. By the way KFC does actually have Chefs. I met a bunch of them staying at a hotel once in Texas. They were from all over the world and were there for a week long training and experimenting with new recipes. I can’t imagine they had much taste for chicken at the end of the day but didn’t seem to have a problem with throwing down a few drinks. Thanks Tom for the great Blog. Enjoy your insights to China, homeland of my four children. lots of talk about nothing , Many of the people talking about China really don’t understand the Chinese person or the culture .